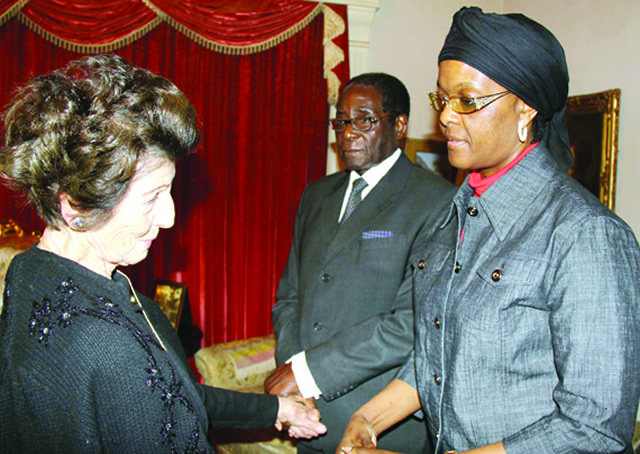 FILE PIC:Kiki Divaris being consoled by President Mugabe and First Lady Amai Grace Mugabe at her Alexanda Park home following the death of her husband, Dr Anthony Divaris in 2010. Kiki passed on peacefully Saturday morning. Prominent modelling guru and philanthropist, Mrs Vassiliki Babaletakis Divaris, better known as Kiki Divaris has died.She peacefully died in her sleep this morning, 72 hours after admission to Borrowdale Clinic Trauma Centre for pneumonia. Kiki surfaced in the public arena shortly after Independence as a renowned designer of the dress worn by the first black Miss Zimbabwe. Survival and Development Foundation, whose patron was President Mugabe. She was survived by two sons Sotirios and Dimitris, two grandchildren and two great grandchildren. Mourners are gathered at 68 Churchill Avenue, Alexandra Park, Harare.